Storm Cases are more than just watertight, padlockable and made in the USA, they’re also Unconditionally Guaranteed for Life. 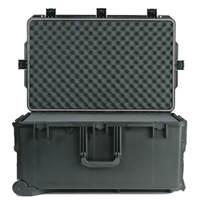 Storm Case’s Storm Trak® series boasts uniquely rugged, yet lightweight, telescoping handles that lock in place plus rugged in-line wheels for ease of transport. * Total height shown includes lid depth of two inches.